Part of the North Country Trail and modeled after the popular Manistee River Trail to the south, Fife Lake Loop Trail was dedicated in 2014 as a reroute of the original NCT from Old US-131 State Forest Campground to M-186. The new trail was built by the Traverse City Hiking Club and includes scenic vistas of the Manistee River, crystal clear lakes and remnants of Michigan’s golden era of lumberjacks and loggers. Now the original trail and the new segment can be combined for an overnight outing and a perfect weekend backpack. From Old US-131 Campground the new trail skirts the scenic Manistee River for almost 4 miles, heads north along Fife Lake Creek and then winds through the picturesque Headquarters Lake region to Spring Lake State Forest Campground where many backpackers set up camp. Or a nearby spur trail makes it possible to spend the evening in the historic village of Fife Lake, a former logging community dating back to 1872. Within town there are accommodations, supplies, a variety of restaurants and even a place to kick back and enjoy a cold one. 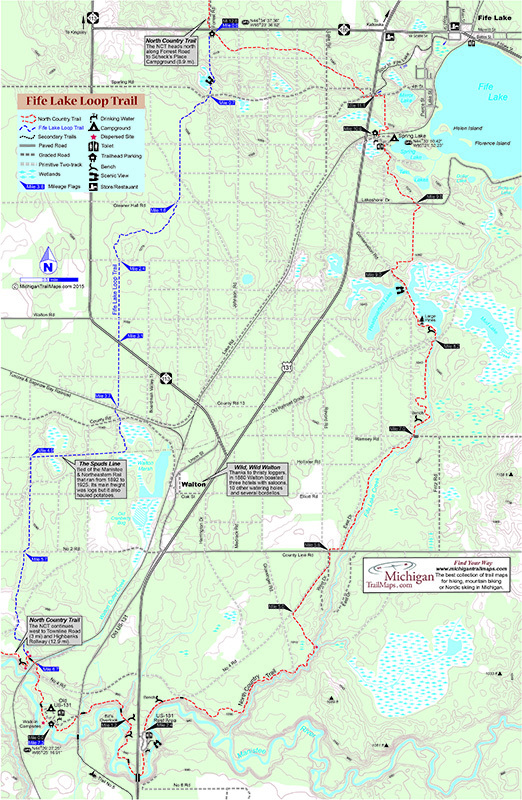 The Fife Lake Loop Trail map is part of the Classic Trails of Michigan series from MichiganTrailMaps.com, your trusted companion for trail information. The large format map measures 11 by 17 inches, is printed on durable card stock and coated to be water resistant. Includes all distance markers, contour lines, historic buildings and ruins. Best of all, when folded it fits in your back pocket or the side pouch of your pack.